Antipasto Misto Per La Famiglia. 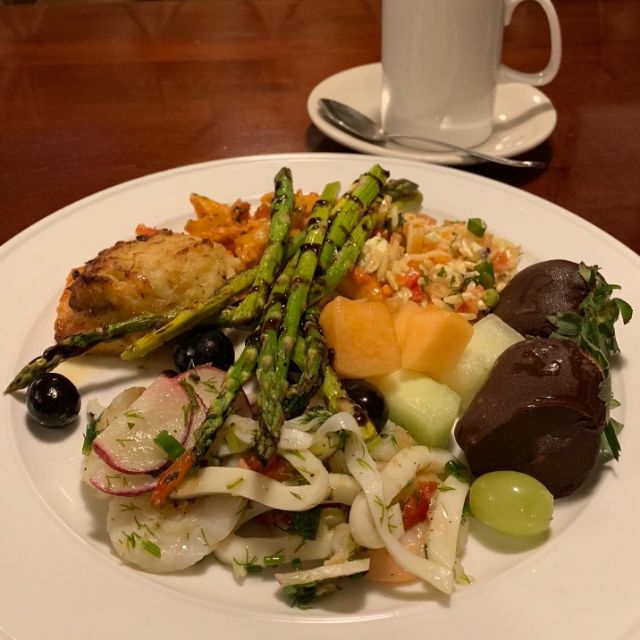 Variety of hot and cold antipasto served family style (ask your server). Broiled shrimp wrapped with bacon and served in a bourbon BBQ cream sauce. Fried tender calamari tossed with hot cherry peppers and served with marinara sauce. Tender pieces of calamari in a lemon olive oil. Broiled portobello mushroom served in a white wine garlic sauce. Stuffed portobello mushroom topped with sausage and gorgonzola cheese in a garlic white wine sauce. Artichokes stuffed with crabmeat, served in a white wine garlic sauce. Fresh mozzarella lightly dusted in bread crumbs with fresh tomato and a touch of marinara in a garlic caper white wine sauce. Littleneck clams sautéed with garlic & oil, fresh tomato, seared pancetta and a dash of tabasco. Grilled sausage sautéed with broccoli rabe and cannellini beans in a garlic extra virgin olive oil sauce. Arborio rice balls scented with white truffle oil, reggiano parmesan and wild mushrooms breaded and deep fried, served with a tomato cream sauce. Golden fried long-stem artichokes dusted in parmesan cheese and served with a creamy roasted garlic sauce. With roasted and hot peppers with provolone cheese. Our homemade jumbo lump crab cakes served with a lemon saffron sauce. Portobello mushroom, baby cipollini onions, red peppers, zucchini, asparagus and artichokes in a balsamic glaze. Antipasto Misto Per La Famiglia. Variety of hot and cold antipasto served family style (ask your server). All salads may be topped with chicken (add $3), shrimp (add $6), salmon (add $8), filet mignon tip (add $8) or crabcake (add $8). With bermuda onions, carrots, cucumbers and tomato in our homemade Piccolo dressing. With romaine, seasoned croutons and parmigiano reggiano. Chopped greens with imported meats and cheeses. Walnuts, apples and gorgonzola cheese in our homemade Piccolo balsamic vinaigrette. Vine-ripened tomatoes, prosciutto, ripe tomatoes, artichokes, fresh mozzarella, roasted peppers and mixed greens with a balsamic glaze and extra virgin olive oil. Arugula, marinated artichoke hearts and jumbo lump crab meat in a lemon extra virgin olive oil sauce. Baby arugula, walnuts and pine nuts dressed with Piccolo's balsamic dressing and topped with poached pears, melted gorgonzola and mozzarella. With pine nuts, raisins and poached pears in a raspberry vinaigrette. Topped with red onion and fresh mozzarella in our house dressing. Calamari, shrimp and jumbo lump crabmeat in a bed of greens, tossed with lemon olive oil, garlic and parsley. Radicchio, fresh fennel, grape tomatoes, cucumbers, ruby red grapefruit wedges and baby arugula tossed with extra virgin olive oil and aged Sherry vinegar. With pistachios and crumbled blue cheese in a raspberry vinaigrette over mixed greens. With turkey, roast beef, fresh sharp provolone cheese, red peppers & sliced hard boiled egg. With black olives, red peppers, bermuda onions, fresh mozzarella and cherry tomatoes with a balsamic olive oil dressing. With ham, salami, sharp provolone, tomatoes, artichoke, kalamata olives, red peppers and prosciutto. Prosciutto, soppressata, sharp provolone, shaved reggiano, fresh mozzarella, kalamata olives, roasted peppers, marinated artichokes and grilled marinated vegetables drizzled with extra virgin olive oil and fresh basil. Ask your server for our homemade chef's daily special soup. Penne, Linguini, Spaghetti, Capellini or Fettuccine with your choice of sauce: Marinara, garlic & extra virgin olive oil (Olio sauce), or mushroom sauce. Thick spaghetti pasta, slow-cooked ground beef and aromatic vegetables with our special Italian spices in our Piccolo's marinara sauce. Sautéed chicken, asparagus and sun-dried tomatoes in a white wine butter sauce. Fresh plum tomatoes, basil and fresh garlic. Fusilli pasta with a mixture of porcini, shiitake, oyster, and portobello mushrooms in a mascarpone cream sauce with truffle oil and reggiano parmesan cheese. Sautéed pancetta with shallots in a parmesan egg emulsion. WIth garlic and plum tomato sauce. Sweet Italian sausage and garlic in a creamy parmesan sauce. Choice of whole wheat (add $2) or egg fettuccine, peas, eggplant, carrots, asparagus and cherry tomatoes in a white oil and garlic sauce. Roasted eggplant, black olives and cherry tomatoes in a garlic white wine sauce. Baby shrimp and chicken in a pesto cream sauce. Roasted eggplant, roasted peppers and grape tomatoes tossed with rigatoni and topped with fresh mozzarella. Pasta tossed with a tangy sauce with grape tomatoes, sautéed pancetta, onions, fresh basil and fresh garlic. Ear-shaped pasta with grilled chicken, broccoli florets and sun-dried tomatoes in a garlic white wine sauce. Fusilli tossed with sautéed broccoli rabe, garlic, sweet sausage and olive oil. Pasta tossed with a touch of old world ragu (chunks of stewed veal, onions, carrots and plum tomatoes). Pappardelle pasta tossed with sautéed baby shrimp, garlic, broccoli florets, grape tomatoes and fresh goat cheese. Flat wide noodles tossed with jumbo shrimp and grape tomatoes in a lemon cream sauce with chopped fresh chives. Chunks of sautéed chicken in a light garlic white wine sauce with grape tomatoes, asparagus, fresh goat cheese, thyme, artichoke hearts and pistachio nuts. Egg noodle pasta in a creamy parmigiano and pecorino romano cheese sauce. Choice of Pasta & Piccolo's Sauce. Rigatoni pasta folded with parma prosciutto with a touch of marinara in a vodka cream sauce. Cheese-filled ravioli and baby shrimp in a tomato Aurora sauce. Our homemade ricotta potato dumplings in a choice of Gorgonzola cream sauce, Vodka cream sauce, Marinara, Bolognese or Pesto sauce. Sautéed chopped tomatoes, olives, capers and pieces of anchovies in garlic extra virgin olive oil. Choice of Whole Wheat (add $2) or Regular Pasta sautéed with broccoli florets in garlic extra virgin olive oil. Sautéed in choice of Piccolo's finest sauce: Gorgonzola, Pesto sauce, Marinara, Alfredo, Meat sauce, Vodka sauce or Butter and Truffle Parmigiano Oil sauce. Homemade gnocchi potato dumplings sautéed with spinach and tomatoes and topped with fresh mozzarella in an Aurora sauce. Your choice of pasta sautéed with long hot peppers and kalamata olives in a garlic marinara caper sauce. Pappardelle pasta sautéed with chicken and sun-dried tomatoes in an Aurora sauce. Battered eggplant, layered and baked with Piccolo's marinara sauce and mozzarella cheese. Choice of pasta. Battered eggplant rolled with our parmigiano ricotta cheese mix and topped with Piccolo's marinara sauce and mozzarella cheese. Choice of pasta. With Ricotta topped with marinara sauce and mozzarella cheese. Arborio Classical Risotto (rice). Piccolo's daily risotto (see server). Piccolo's homemade lasagna. Layered pasta with Piccolo's meat sauce & marinara topped with parmigiano & mozzarella cheese. With chopped eggplant, mozzarella and marinara. Includes your choice of spring mix or french fries. Sautéed with broccoli rabe and provolone cheese. With hot cherry peppers, mushrooms and fontina cheese. Roasted with peppers and fresh mozzarella spread with a basil pesto sauce. Bacon and sharp provolone spread with a honey mustard dressing. Romaine lettuce, sliced tomatoes and roasted peppers spread with caesar dressing. Grilled eggplant, zucchini, roasted peppers and portobello mushroom. With spring mix, tomato and caesar dressing. Sautéed garlic, roasted peppers and spinach topped with mozzarella cheese. BBQ sauce and melted provolone cheese. Grilled sausage sautéed with garlic and broccoli rabe. Layered parma prosciutto, tomatoes, roasted peppers and fresh mozzarella topped with Piccolo's dressing. Fresh ground beef cooked to your liking. Lettuce, tomato, onions and cheese served with french fries. Toppings: Burger, Steak or Chicken Steak toppings: cheese, mushrooms, peppers, onions, bacon, cheese wiz, hot peppers, mayo, ketchup, etc. Each topping $0.60, additional meat $3. Individual Pizzas 12''. Available Toppings: Pepperoni, Sausage, Mushrooms, Meatballs, Spinach, Broccoli, Onions, Bacon, Green Peppers, Olives, Garlic, Ricotta Cheese, Anchovies, Tomatoes, Extra Mozzarella Cheese. Individual add$1 or Regular add $2. Special Toppings: Broccoli rabe, Roasted Red Peppers, Prosciutto, Grilled Chicken, Sun-dried Tomatoes Individual add $2.29 or Regular add $2.79. Also available: Gluten Free Pizza "12" only $9.99. Additional toppings extra. Round pizza topped with plum tomatoes, fresh mozzarella and fresh basil. Top of line Grande cheese, fresh garlic, basil, parmigiano cheese, oregano and extra virgin olive oil. Square thin crispy pizza with Piccolo's secret plum tomato sauce, fresh mozzarella, fresh basil, extra virgin olive oil and a touch of parmigiano cheese. Whole wheat dough available upon request! Our top of the line cheese: fresh mozzarella, ricotta, sharp provolone, parmigiano and fresh basil. Plum tomatoes, mushrooms, prosciutto, kalamata olives, fresh basil and fresh mozzarella cheese. Sautéed shrimp, scallops and calamari in a marinara sauce topped with mozzarella and fresh basil. A cheeseless pie with tomato sauce, olive oil, fresh basil and fresh garlic. Choice of soup or salad. To substitute pasta, add $2.59 for Broccoli or Spinach Saute. Choice of pasta: Capellini, Penne or Spaghetti. Mixed mushrooms in a demi-glaze wine sauce. Battered with egg emulsion in a lemon white wine sauce. In a garlic caper lemon white wine sauce. Sautéed with mushrooms, roasted red peppers, kalamata olives and a touch of marinara in a garlic white wine sauce. Sautéed spinach and sage layered with parma prosciutto and fontina cheese baked in a white wine sauce. Sautéed with figs and porcini mushrooms in a cognac cream sauce. Sautéed shrimp, asparagus and artichoke in a champagne cream sauce. Lightly breaded and pan-fried on a bed of spring mix tossed in fresh squeezed lemon, extra virgin olive oil with kalamata olives, fresh tomatoes, bermuda onions and shaved parmigiana reggiano cheese. Sautéed shrimp and spinach topped with mozzarella cheese in a butter garlic white wine sauce. Sautéed with porcini mushrooms and hazelnuts in a Frangelica cream sauce. Sautéed with asparagus and jumbo lump crab meat in a brandy cream sauce. Sautéed with broccoli rabe, portobello mushrooms and roasted peppers in a garlic white wine sauce and topped with melted sharp provolone cheese. Sautéed with artichokes, roasted peppers, portobello mushrooms and rosemary in a white wine garlic sauce topped with sliced potato. Tossed with spinach and fresh mozzarella in a pink cream sauce. Sautéed with sun-dried tomatoes, eggplant, and prosciutto topped with mozzarella cheese in a light marinara sauce. Pieces of roasted chicken on the bone with our special seasonings and served golden brown. Choice of soup or salad. To substitute pasta, add $2.59 for Broccoli or Spinach Saute. Choice of pasta: Capellini, Penne or Spaghetti. Available Whole Wheat & Gluten Free Pasta, add $2. Grilled salmon over sautéed cannellini beans and spinach in a port wine reduction. Littleneck clams steamed with fresh basil in a garlic and extra virgin olive oil or marinara sauce and served over pasta. Sautéed shrimp with fresh basil, garlic and extra virgin olive oil served over pasta. Dipped in egg emulsion and sautéed in butter lemon herb sauce over pasta. Sautéed with fresh tomatoes, fresh basil, garlic and extra virgin olive oil or marinara sauce served over pasta. Shrimp Fra Diavolo, Parmigiana or Francese. (Red or white) clams, mussels and shrimp. Pieces of smoked salmon with sautéed red onion and baby peas in a pink cream sauce over bow-tie pasta. Shrimp, scallops and portobello mushrooms in a Sherry wine pink cream sauce. Shrimp stuffed with crabmeat in a garlic white wine sauce over spinach. Sautéed with chunks of salmon, sun-dried tomatoes, broccoli rabe and jumbo shrimp with garlic and oil. Sautéed filet of tilapia with baby shrimp and jumbo lump crab meat in a garlic white wine sauce with grape tomatoes over capellini. Sautéed with olive oil & garlic and topped with mozzarella. Roasted and served in garlic and oil with a touch of balsamic glaze. Our first time there. Food was delicious! They were able to accommodate our seating request. Will definitely be back! We enjoyed our dinner with friends! We will be back again! Great menu and great service. This has become our 'go to' new year's eve spot with friends. And we now go 'other times' because it is such a great place! Great food (including home made pasta); extensive menu; good location. Service could have been better; once the food was dropped, it took awhile to flag down a staff member for missing items. The food was just okay. Service was just okay. We've been here before and to be honest, nothing stood out to want to make us return. This was our first time here, but not our last! Everything was perfect! We highly recommend this restaurant. Basic pasta meals are high quality and a safe bet - avoid the filet mignon, which was rubbery inside. Service is very attentive; try to avoid back room where large parties and families with small kids are seated. I was surprised, as we’ve been to the restaurant before and had better food and service. I hope this was just an off night- but it was off enough that we may take a long time before giving it another try. Food was great. Everybody liked what they ordered. Service was excellent. No complaints here. Reservations honored on time. Varied menu, everyone found something they liked. The guitar player was a nice touch also. Will Definitely go back again! 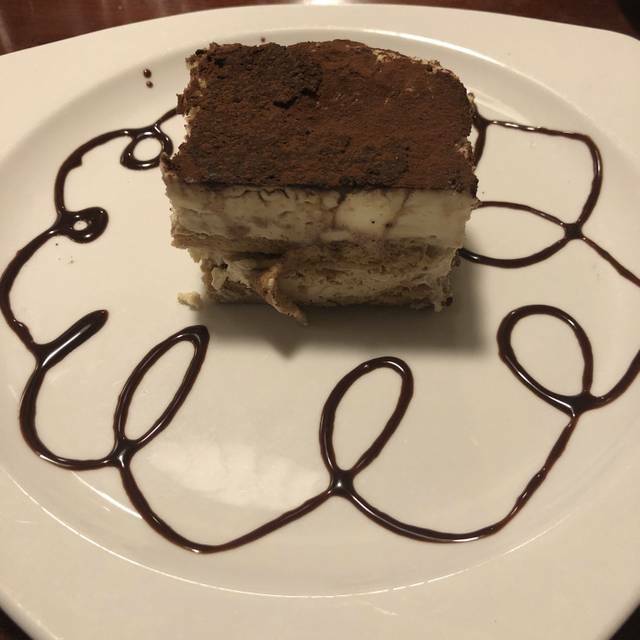 While it does not look like anything special from the exterior (in a strip mall), the interior has all the ambiance of an Italian restaurant and the food is exceptional. Gluten-Free pasta and pizza options too. Food is delicious and service always excellent. The food was good but the menu for Valentines was very restricted. Plus the prices were jacked up for the special day. The restaurant was packed and very noisy. Our server was good but the general manager handled our check and overcharged us. It got straightened out but all in all it was not a great experience. I guess my recommendation would be to eat here only when they have their regular menu & its not busy. We went Valentine’s Day, because we had two kids (18 and 13), they sat us in the back room in the “kids” section. The average age of the kids was 7 and under. Our food was excellent, service was great. Will definitely go back. We come here on 'non occasions' by ourselves and meeting friends and love the menu and staff. NYE 2018 was our third year here because it is such a good deal! Invited additional friends this year and they loved it as well. CONGRATS to the chef and staff! Food and service was great! Celebrated Christmas Eve dinner with family. My husband enjoyed the traditional Italian seven fishes, I enjoyed the chicken piccata and the rest of our family enjoyed what they ordered. Food and service were fantastic. Definitely coming back! Everything was excellent. Food was great, server was also very attentive. As always, wonderful ambience and food. There were challenges with seating as we waited 25 minutes for our table (with a reservation). Not sure what the issue was but many others experienced the same challenge. Overrated and overcrowded. We had reservations at 6:30 for 4. There was a line out the door of people giving their names. I had to push my way to the beginning of the line to let them know I had a reservation. We did get seated right away. It took 10 minutes for waiter to come over and ask for our drinks. Service was very slow throughout the evening. Waiters seemed overwhelmed. My friend's knife was dirty. Had to ask 4 times for a new knife before she finally got one. Calamari was excellent. Seafood bisque was okay but had way too much salt in it. I felt like my blood pressure was going up. Friends liked their entrees which was Veal Parm. However, I got the stuffed shrimp for $25.00. Shrimp was cooked too long because it was dry and tough. I could barely cut it. It was also very salty. Waiter wasn't around so I didn't say anything. Waiter never came to ask if we wanted coffee or desert. I had my credit card on the table BEFORE we even got the bill. All of a sudden the owner comes over and snatches it. I quickly said we never got the bill, but he kept on going. He came back without a run down of the bill, just the total and charged the whole bill on my card when we were going to split the bill with our friends. Very rude. Then people came over to wipe off the table before we could even get up. Apparently, there were people waiting for the table. Wow...so rude. Never again. Excellent service and food. I had Chicken Milanese and the breading was perfect and buttery, and the salad had a nice combination of greens including spinach. The dressing was light and perfect. I would definitely go back again! Food was excellent. Didn't seem like they had enough servers. Waitress seemed distracted and made some minor mistakes. I would definitely go back and recommend this place. Really poor service. Decent food and prices, but the level of service was inexcusable. Their Sunday brunch is outstanding. Excellent and affordable Sunday Brunch! Everyone was warm and friendly and the food was great! We read other reviews regarding cool temperature in restaurant so we brought jackets and were very comfortable. Food was delicious- temperature in the restaurant was similar to a freezer. Very uncomfortably cold. Our second visit since this restaurant opened and they have definitely worked out any service issues other diners previously reported. As a matter of fact, they have a lot of staff and the service was excellent. Our dinners were delicious (we both had veal entrees) and the portions very generous. My one and only concern is the restaurant was freezing. It was a very humid 90 degrees outside so it never occurred to me to bring a sweater or jacket, but obviously frequent diners were in the know. Many people brought or went to their cars to grab jackets. The staff was well aware of the chilly air, but told us they cannot do anything about it because if they raise the temp, the condensation in the restaurant becomes a major problem. We will definitely return (perhaps after the air conditioning weather) because the menu/food is excellent as is the service.